BEIRUT, Lebanon — When Turkey, Iran and Russia meet to talk about the end of the war in Syria, they do so without the United States. Peace talks to solve the Israeli-Palestinian conflict have been frozen for years, but the long-awaited Trump plan to break the impasse has yet to arrive. And now, despite conflicting messages about how and when it will happen, the United States is set to withdraw from Syria. The withdrawal, which the military said began with equipment removal on Friday, is just the latest instance of a broader American disengagement from the Middle East that could have lasting effects on one of the world’s most volatile regions. As the United States steps back, Russia, Iran and regional strongmen increasingly step in to chart the region’s future. Since the end of the Cold War, the Middle East has remained perpetually near the top of the American foreign policy agenda, kept there by the Persian Gulf War of 1990-91, the American invasion of Iraq in 2003, the Arab Spring and the battle against the Islamic State. American leaders have offered a range reasons for the great investment of American blood and treasure in the region: to replace dictatorships with democracies, to enhance the rule of law, to support allied governments and to fight terrorism. But for some scholars of the region, the concrete benefits of all that engagement pale in comparison to the size of the American efforts. “When you look at the cost-benefit analysis, there is a limited payoff, and the United States is going to reduce its footprint over time because there are so many other things to deal with in the world,” said Gary Sick, a Middle East scholar at Columbia University who served on the National Security Council under three presidents. A similar view of the region has shaped the approach of both the Obama and Trump administrations. Despite the drastic differences in their words and style, both have viewed the Middle East primarily as a source of nuisance that siphoned resources from other American priorities. Both presidents called on regional powers to play a greater role in protecting and governing the region. The immediate desire to step back was driven by battle fatigue after years of deadly combat in Iraq, and a feeling that American military investment often did not make matters better. But scholars say that longer term shifts have made the region less central to America’s priorities. American protection is no longer necessary to ensure the free flow of oil from the Persian Gulf, for example, and a boom in domestic production has made the United States less dependent on Middle Eastern oil anyway. Israel now boasts the region’s most effective military and a strong economy while many of its neighbors are in shambles, making it less dependent on American protection. “The reality is that our direct interests in terms of protecting the American homeland are very few in the Middle East,” said Mr. Sick, adding that the record on American interventions doing more good than harm was at best mixed. “Things are pretty chaotic as they are, and I don’t see them getting better with our presence and I don’t see them getting worse if we’re not there,” he said. Others argue that American leverage still matters and can make a difference when the United States chooses to use it. They point to examples such as the Libyan dictator Col. Muammar el-Qaddafi’s giving up his country’s nuclear program under American pressure. The Israeli-Palestinian peace process began with and was nurtured by American involvement, although Mr. Trump’s moving the American Embassy to Jerusalem last year undermined a sense among Palestinians that the United States could serve as an honest broker. And pressure by American presidents pushed both Egypt and Saudi Arabia to take modest steps toward political openness. Although President Trump has spoken little of human rights abroad while unabashedly embracing autocratic allies, many analysts said that even when the United States did champion democracy and human rights, it was tainted by the whiff of hypocrisy given its support for regional strongmen and its reluctance to punish them. It was under President Obama, for example, that Egypt killed hundreds of civilians protesting a military coup and Saudi Arabia executed 47 people in one morning. Neither faced meaningful sanctions. Nor did Mr. Obama enforce his self-imposed red line after Syria killed more than 1,000 people in a chemical weapons attack. Such positions have battered the reputation of the United States in the Middle East as a champion of democracy, rule of law and human rights. But as the United States pulls back, regional powers are left to their own devices and other foreign states move in. With little notice to the United States, Saudi Arabia began a military intervention in Yemen that nearly four years later has failed to dislodge the Iran-aligned rebels it targeted while causing a humanitarian crisis. Iran has deepened its ties with militias in Syria, Iraq, Lebanon and Yemen, undercutting their governments. 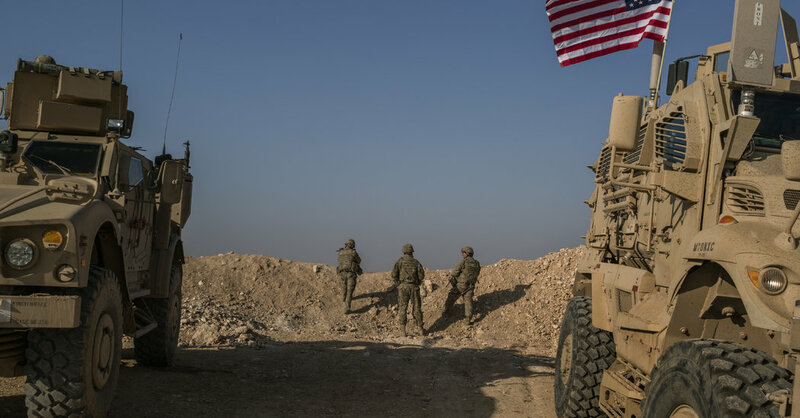 And the American withdrawal from eastern Syria could set off a scramble between Russia, Iran and Turkey to fill the void. While the players are new, their intervention perpetuates the history of foreign interference that has kept Arab states weak, said Rami G. Khouri, a professor of journalism at the American University of Beirut and a senior fellow at Harvard University’s Kennedy School of Government. As the United States begins to withdraw from Syria, critics have compared the move to President Obama’s decision to withdraw American troops from Iraq after deciding that America’s military role there was no longer essential. Within a few years, the jihadists the United States had thought were defeated were back and stronger, rebranded as the Islamic State, and prompting a new American military operation. That operation has now nearly succeeded in ousting the jihadists from the territory it once controlled. But it has also left entire cities in ruins with no clear path to rebuilding and done little to address the issues of poor governance that fueled the jihadists’ rise. Many fear that could cause the cycle to repeat itself — again. Some say the only solution is for the United States to find more productive, long-term ways to be involved in shaping the region’s future as opposed to just using force when there is a crisis. “We have got to find a middle ground between trying to transform the Middle East and increasingly walking away from the Middle East,” said Mr. Haass of the Council of Foreign Relations. Analysis, Exits, Faces, Mideast, News, PostAmerican, Syria, U.S.